A collection of 6 Pennsylvania redware plates, late 18th century-early 19th century. 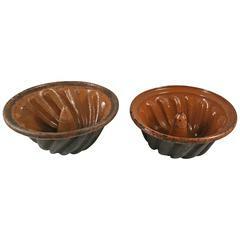 A nice collection of Primitive country cake molds, Pennsylvania Redware, called "Turk's Heads" due to their shape, circa 1800-1850. Two Pennsylvania redware "Turk's Head" cake molds, mid-late 19th century. 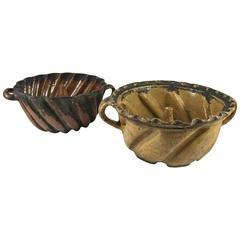 A nice collection of two early Pennsylvania "Turk's Head" cake molds, the yellow being from the 1770s and the brown from the 1790s, excellent condition considering age and use. 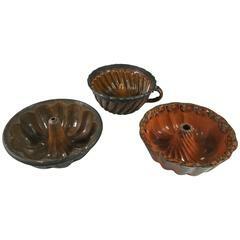 A collection of 3 early Pennsylvania redware "Turk's Head" cake molds, late 18th century. Brown and mint creamware terracotta plate with late neoclassical watermark bordering scene depicting a bird typical of this period. 19th century French hand-thrown pottery crock with applied handles.